While most construction and development companies have at least some understanding of the benefits of working with a professional land surveyor, one of the services they may fail to take into account is litigation support. Most people never plan on having to go to court, but when you find yourself in a situation where you do need legal support, having an expert you can count on can be an invaluable asset. Our judicial system relies heavily on the use of construction expert witnesses. Basically, this idea rests on the fact that judges and juries can’t be expected to make rulings on certain technical issues without a deep understanding of those issues. Instead, litigants can bring in expert witnesses to explain the situation to the court in a way that they understand. The key thing to remember is that if you find your company embroiled in a legal conflict, you can expect for your rival party to bring their own expert witness in front of the court to explain the issues in a way that is favorable to their clients. Showing up without your own construction expert witnesses to counteract this could be disastrous for your case. In addition, it’s important to realize that credibility matters when it comes to expert witnesses. The people doing the judging are not experts themselves; therefore, a big part of whether or not they believe a witness’ testimony has to with how credible they find the witness as an expert. Since professional land surveyors spend a good chunk of their lives engaged in land surveying, it’s safe to assume that they make credible experts on the subject. What types of cases can a land surveyor provide litigation support for? Your organization could be taken to court for any number of different reasons, including for things that occur before, during, or after a project. Any time a plaintiff can allege that your company caused injury or financial damage through negligence, your company may be at risk from a legal standpoint. 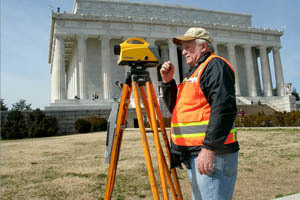 The cases that a land surveyor could help you with include, but are not limited to, accident scene documentation, construction dispute resolution, project errors and omissions, and all types of encroachment issues related to boundaries or easements. If your organization is facing legal action, and you’re considering hiring a land surveying firm to help your case, there are a number of different factors you should take into account in order to make sure that you’re making the right choice. The first factor to consider is experience. Litigation support is not something that all land surveying firms do on a regular basis, and if you hire a land surveyor that doesn’t know the ins and outs of the courts, then chances are good that they won’t be able to provide you with the kind of protection you’re looking for. Make sure you hire a land surveyor who has experience providing the specific kind of litigation support you need. Also, make sure to consider turnaround time when picking a land surveying firm to provide litigation support. If the firm you hire doesn’t move quickly, sending a team to investigate the site and start gathering information within a few days, then you might not be able to count on them to get results for you when your case goes to court. Hiring a land surveyor is not a guarantee of victory, but it will put you in the best possible position to protect yourself against legal action. To learn more about how a professional land surveyor can help you, contact Landpoint today.